SWANTECH wrote: You folks are assuming they survive bankruptcy. I do not think they are going to find 600 Million dollars. I could tell you folks some stories about this Henny, and Gibson. The reason I do NOT, and will NOT own a Gibson from 1982-2018. Is they are made WRONG. I will teach you folks. Henny basically Union busted the company on purpose when he moved Gibson from Kalamazoo to Nashville. All the skilled luthiers that new how to build a guitar were told if they still wanted a job. They had to move and take a huge pay cut, and NO union. So all these new people in Nashville did not have the knowledge or skill set of how to build a Gibson guitar. So when they started setting up guitars. With the guitar laying down on a bench, and NOT in proper playing position. They ran into problems with intonating the tuneomatic bridges. Because a guitar will go sharp/flat 10-20 cents from laying on it's back to the playing position. This is due to the earths gravity. Fact. Instead of learning how to setup a guitar correctly in the playing position. They moved, and changed the angle of the tunomatic bridge. I have seen them set up guitars with them laying down on a bench, with my own eyes. I have toured the factories. So now. You barley have enough room at the E strings. Especially the low E string to get the guitars properly intonated. This is just ONE of many design changes over the years that has made their guitars worse for guitar players. Funny though. The Sammick made Epiphones bridges are placed correctly. They do a half A$$ job setting them up. They rarley cut the nut slots. Sometimes the nuts don't even have enough material to cut a nut slot. The saddles are not cut or even adjusted on the high end custom shop stuff. They want to sell a Les Paul Custom at $5,000.00 with the nut and saddles not cut. Not set up at all. With an ebonal (fake ebony) finger board. My 1976 Les Paul custom is a great guitar. It stays in tune because it was built by people who knew what they were doing. Don't get me started on the plastic in the so called nitro finish they use. Because it is barely nitro anymore. When was the last time you saw a Gibson finsh have checking? 1982. Proof it is not the nitro you think it is. I can go on. I can state all the design changes that they made to make the guitars more, and more WRONG over the years. That is why I stopped buying Gibson products a long time ago. I have worked for a Gibson dealer for going on 23 years now. I have a unique perspective. Thousands of Gibsons have been in my hands. If Gibson does survive. I hope they start making great guitars again. If you wrote a book I would buy it and read it. The Gibsons have a nitro (with plasticizer) finish on all USA Gibsons. Fender has a POLYESTER finish. The Epiphones have a polyurethane clear coat. USA kramers had a polyester clear coat. Every shop in MIchigan, and many large shops, and large chains, do NOT setup every Gibson because it would take forever for the shop to do. When you have hundreds of guitars in stock. Plus that would KILL your repair business. Gibson just uses the excuse that the new owner needs to set it up to their individiual liking. This in my opinion is total BS. Every single PRS comes from the factory setup perfectly. Every Ibanez, ESP, Jackson, Fender, Squier, Etc..etc. that comes into my store is better set up than a Gibson. So the Tronical crap tuners that break when you sneeze on them are an evolution. When the market place did not want them. They don't work anyway because they do not intonate the notes at the bridge. So yeah, it will change tuning, but you are NOT intonated. They only have a one year warranty on electronics. Then make it so that ONLY the customer can purchase a replacement tuner direct from Gibson at $50.00 a pop. Biggest RIPOFF EVER. Oh wait, I forgot. Now that the tuners tune automatically. Lets put a brass nut on these guitars so that the brass nut wears out in 6 months. Better yet. lets change the nut width at the neck, and the string spacing to be wider (2015), and completely F up the entire line of guitars. I don't see any other company completely changing their specs without the demand to do so. Thanks Hennry. We could not give away the 2015 model guitars. Infact we still have a few of those turds we cant flush in my store. Last part of this rant is. If anyone wants to be a true elitist about guitars. Just by a PRS and be quiet. Because the FACT is. NOONE has EVER made a guitar like how a PRS guitar is made. To the quality standards of how a PRS guitar is made. It is truley an amazing thing to see. I own several PRS guitars. Three of these guitars are worth over $5000.00 EACH. This all being said. I still love my MIM Fender Strats, and vintage Kramers. I love these guitars and they play and sound great. I love all guitars at all price points. They all have a place in my toy box. I like having all the color crayons. I am an authorized Gibson Warranty repair technician. Just passionate about stuff. I like to try and share my knowledge. Yesterday I had a customer ask me if I could repair the INCLINATION on his guitar. He gave me a wierd look. He did not get my joking smart a$$ response. a person's natural tendency or urge to act or feel in a particular way; a disposition or propensity. "John was a scientist by training and inclination"
synonyms:	tendency, propensity, proclivity, leaning, predisposition, disposition, predilection, desire, wish, impulse, bent, bias;. Then I told him yes. I can repair the intonation on your guitar. No problem. Fender introduced polyurethane finishes (often shortened to “urethane”) on its instruments in the late 1960s; allowing a glossier, more even finish by replacing multiple layers of nitro clear coating with a mere two layers of aliphatic urethane. Fender continues to use urethane finishes on many of its instruments (American Standard Series, various artist models), with variants including flatter satin urethane (necks on Deluxe, Standard, Highway One, American Deluxe and American Standard models) and thicker, shinier gloss urethane (American Specials, Ritchie Blackmore Stratocaster). Polyester is just for mex models. So please spare me with that kind of knowledge. As for Gibbys, the modern finish on my ex Studio Shred or my current Studio has zero to do with traditional Gibson nitro. It is way harder and more durable than the traditional nitro (of which I have a couple next to this for comparison), not sticky and no fading/cracking either. Many modern plasticizers are urethane-blends by the way. I suspect Gibson use either these (likely) or some PVC-based flavor (maybe), anyway it's not your grandpa's nitro. Polyurethane blends exhibit better structural properties compared to the other plasticizers. Well, maybe it's time for a change. But in reality if it wasn't for Henry in the 80's there might not have even been a Gibson today - for better or worse. Not that the government under the previous administration made it any easier for Juszkiewicz. They bled money with the whole shebang with the Indian rosewood, and then with the Honduras mahogany - when other manufacturers (whose CEOs supported the previous administration) were given a pass. PRS especially in 2015 when it bought highly figured quilt maple from a mill who got the wood from poachers - who cut trees in a National park. The mill owner and the poachers were sent to the clink, yet PRS got to use all that wood on their guitars. Guitarists however are pretty fickle when it comes to innovation. Not saying that I necessarily agree with Henry's ideas of what innovation should be. But guitarists are usually resistant. Bass players are more receptive to innovation and new ideas. Ironically one of the things that did Kramer in was all these crazy innovations. Metal rods and plates to affect the "resonance" of the body, built in e-bows, dummy coils (John Suhr had shamelessly copped the idea)… and ironically they had an ex-Norlin employee working for them as well! It's also ironic that a couple of the guitars that boosted Gibson's "rebirth" in the late 80s weren't even Gibsons - they were replicas made by Max and Kris Derrig. So maybe I won't give a pass to Henry J. for some of the crazy desicions. But he moved the ball down the field for 32 years, starting at a time when nobody seemed to want to do so. And with hos own money. Talking of innovation, in 1987 Fender introduced the new Standard Stratocaster with a two way trussrod, 9.5" radius, 22 frets and a much better two pivot tremolo that did away with the nasty bent steel saddles and the screws that stick into your hand. Not quite sure what they were aiming at with the pickups but otherwise an awesome guitar - yet people still want the 21 fret vintage style strats with all the limitations. I don't get it. 80sChris wrote: Talking of innovation, in 1987 Fender introduced the new Standard Stratocaster with a two way trussrod, 9.5" radius, 22 frets and a much better two pivot tremolo that did away with the nasty bent steel saddles and the screws that stick into your hand. Not quite sure what they were aiming at with the pickups but otherwise an awesome guitar - yet people still want the 21 fret vintage style strats with all the limitations. I don't get it. My new Fender American Professional Stratocaster is a great guitar. I had to modify it only slightly. LOL. The necks are very, very nice. It is truly better than the American Standard series. So much so, I sold my American Standard Strat. It was a really solid guitar I had for years. Fender has been doing some great stuff in the past 10 years. I like what they are doing with the other brands they own also. The Jackson stuff is great, the EVH stuff is great, and the gretsch stuff has really improved. 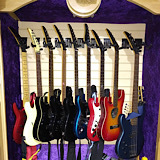 All the squier products are good also. I have a couple Squier Standard Strats I am selling. It is pretty impressive the quality of these guitars. For a $280.00 guitar new. They set up great, and play great, sound great for what they are. They are made from solid woods. I wish I had a guitar made that well when I was a kid. I haven't played the newer Charvels or EVH guitars yet. But the first San Dimas Charvel "reissues" or "continuation" guitars left me a bit underwhelmed as far as feel. The necks felt more like Fenders than Charvels. Have to check some of the newer ones out.